So I thought I'd share with you a few shots of the most beautiful place I have been in such a long time. I was lucky enough to go on several holidays this Summer, however Lake Bled is the one I thought I'd share with you. Breathtaking. Words fail to explain so I thought I'd share some fantastic photos with you. The place is wonderful; fun snowboarding in the Winter and joyous days spent swimming in the lake and relaxing during the Summer! Early morning walks around the lake, the colours are constantly changing, it's so beautiful. Hannah has such a great bikini bod! Mine needs some working on - can you say pear shaped? Luke and Sam munching on some tradiational Lake Bled Cake, apparently it was delicious! 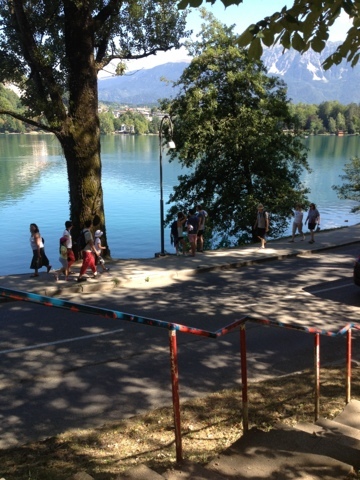 I genuinely implore you to visit Lake Bled, especially in the Summer. It's great for a short weekend of skiing/snowboarding (not big enough for longer!) and a wonderful place to chill if you need a break! After I finished travelling through Eastern Europe and relaxing in Portugal, I have returned home to a new internship! Working at Fluorescent PR, they have so many exciting things happening, I'm super excited and feeling pretty darn lucky (except for today - two flat tyres eugh).